very similar to this one. I removed the rolling tambour piece and added decorative wooden brackets for dividers. I also built a little drawer using scrap wood and added a fun knob. then wiped off to give it an antiqued look. It lives on my kitchen counter to corral papers, bills due, etc. but would be great on a desk too. make an organizer of her own... I love it! and added black and white stripes and a clock face. or find me on Facebook and Pinterest too. Thats a great idea! So cute! Lucy ~ where'd you get the decorative brackets at? 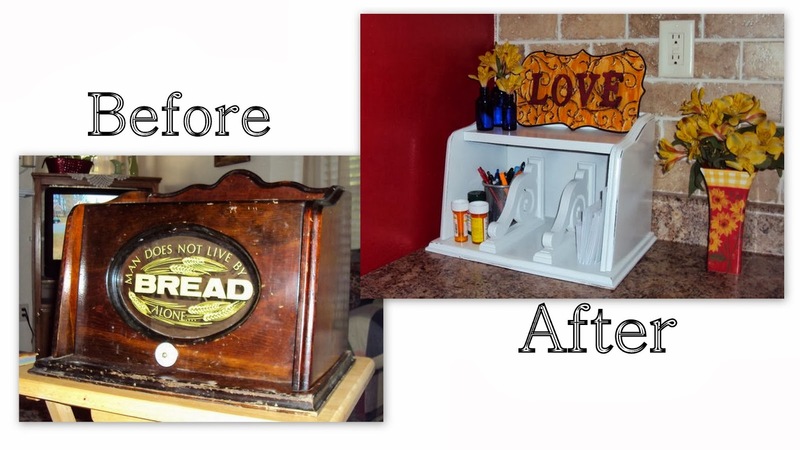 This has to be one of the cutest and most ingenious recycle ideas I've come across in a very long time. How creative of you! I love it. 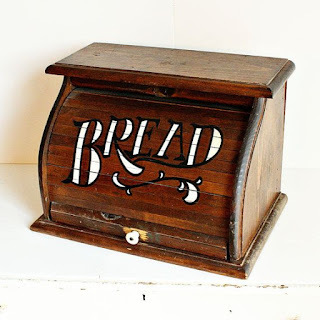 Now I'm going to be scouring the thrift stores for a breadbox to make my own out of...thanks for the super idea.